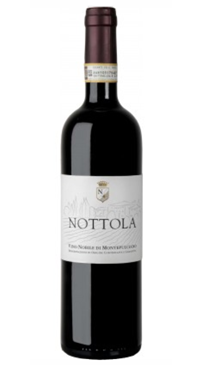 Azienda Agricola Nottola is on a beautiful vineyard hillinside the prestigious Montepulciano area where Vino Nobile di Montepulciano has been produced for thousands of years. The azienda is composed of twenty hectares of vineyards, olive trees and beautiful new cellar where winemaker Riccardo Cotarella skillfully crafts wines that express the land and purity of fruit. The grapes are harvested during September-October and the varieties (Sangiovese Prugnolo Gentile and other red grapes) are vinified separately in temperature-controlled stainless steel containers and maceration lasts between 15 to 20 days. The wine is then aged in Slovenian oak barrels for a period of 24 months. It is a deep, intense ruby red wine with a complex bouquet of ripe fruit, blackberry and raspberry combine with a hint of spices. It is smooth with velvety tannins and incredibly well-balanced.